Lawrence Emerick served in Europe in the Second World War and here he recounts his trip back to France where the D Day landings took place. ‘So after 66 years I saw an advertisement for the 4 day weekend to visit Normandy and the D Day beaches. I had been thinking about this trip but did not get round to it. Now I thought it was about time I went back to see how much things had changed. Obviously they had, there is very little sign of the destruction that occurred everything seems to have been repaired and in the sunshine it would hard to imagine the utter desolation we had seen. Our journey took us via Dover and Calais to Caen. The roads are so much different to 1945, wide and easy to drive along. Then they were crowded and rather difficult to negotiate. From our base in Caen out journey took us to the landing beaches and I was particularly interested in Arromanges Looking over the beach you cannot see anything of the Mulbery Harbour where in June 1945 I had driven onto not knowing what lay before us (at 19 I think it was more apprehension than fear). Parts of the outer breakwater are still visible but you have to see the models in the museum to realise what a feat of engineering it took to put in place. From the top of the hill I could see the exit we made from the beach driven on by shouts of the Beachmasters “to get off the beach as quickly as possible”. You can see a section of the Mulbery Harbour behind the museum which houses models which show how much it was used by so much traffic. 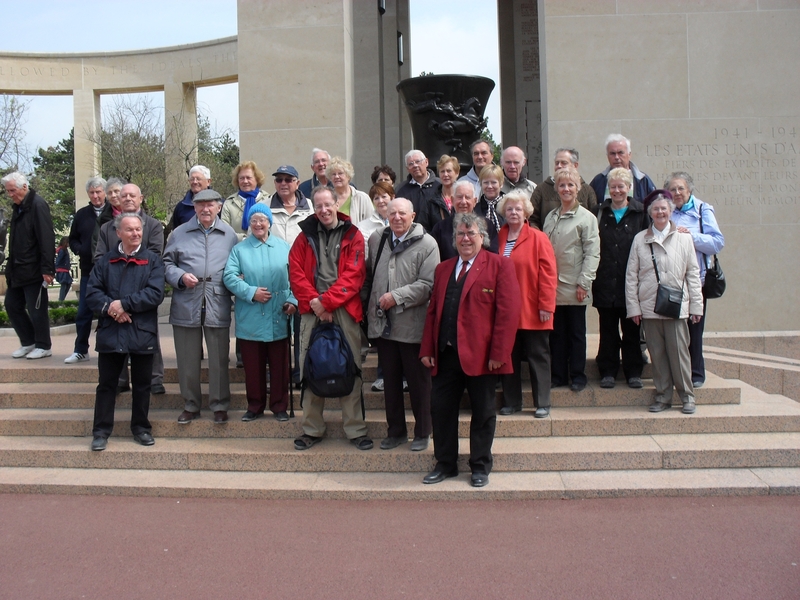 We visited the new Pegasus Bridge over the Orme river, where so many paratroopers were lost. The original bridge is still preserved in a nearby field. We visited the 5 landing beaches Omaha, Juno. Sword, Gold and Utah where so much carnage took place, now it looks so peaceful in the sunshine with miles of golden sand and sand yachts skipping along. On to Pointe du Hoc where the only remaining pill box of the Atlantic wall remains. The bomb craters have been left as they were made a grim reminder of what bombing can do. Ste Mere Eglise now appears a peaceful village. The visits to the American war graves cemetery and the British and Commonwealth cemetery brings home the utter futility of war and the suffering it brings. One headstone read “Driver RASC 19. Another “Unknown seaman 20” (I was 19). Standing looking at the rows of headstones made me feel sad and grateful and tearful to the many servicemen and women who lost their lives. Another visit was the American Air Museum where the town church still sports a parachute hanging from the steeple where the paratrooper got hung up on – he played dead so was not shot at and was rescued. I am a UK citizen currently living in Japan and I recently came across a forgotten shrine that has been left to neglect in a forest in North East Japan.I wrote an article for my website http://theblagsmith.com/ called Obanagamori – The Forest of The Forgotten, I think some of your veterans may be interested in it as I feel regardless of race those who died for their cause should never be forgotten. If you or others find it interesting please let others know and maybe we can provide more recognition to all of the fallen soldiers with forgotten monuments.